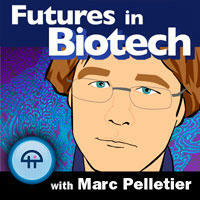 I joined Marc Pelletier on episode 56 of Futures in Biotech for a conversation with Stanford University School of Medicine Professor Karla Kirkegaard. We talked about RNA viruses – where they came from, where they are going, and Dr. Kirkegaard’s unique approach to discovering antiviral drugs. Don’t miss this episode: Dr. Kirkegaard is a brilliant and eloquent virologist who makes complicated science easy to understand. If I understood correctly, Dr Kirkegaard wants to use drugs to target bits of the virus' life cycle in which a mutant resistant virus which is inside a cell alongside one or more susceptible viruses won't be able to complete its life cycle. That is, the susceptible viruses will actively interfere with the resistant virus, keeping it from reproducing and replacing the susceptible strains. Now, she was specifically thinking about the subunits used to construct the capsid. If some drug caused susceptible viruses to produce messed-up subunits, then maybe the resistant virus couldn't manage to ever build a proper capsid and get out to infect other cells. But don't viruses mutate in ways that change their capsids a bit pretty regularly? If the virus isn't enveloped, doesn't it have to do this to adapt to a population of currently-immune hosts with antibody that sticks to the old strain's envelope? (I'm thinking of something like rhinovirus, which has enough strains to keep infecting adults even after we've had 100+ colds in our lives.) That seems like it suggests that mutant viruses can sometimes successfully change their capsids (by a mutation in the subunits, right?) despite the interference of all the other older viruses infecting the same cell.